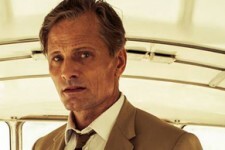 Based on a novel by Patricia Highsmith ("The Talented Mr. Ripley"), "The Two Faces of January" centers on a wealthy American couple (Viggo Mortensen) and (Kristen Dunst) on a tour of Greece in the 1960's. There they meet a con-artist (Oscar Isaac) who becomes entranced with the couple's wealth and beauty. A sudden accident puts all three in danger as they set off through Greece as the trio’s allegiance is put to the test.